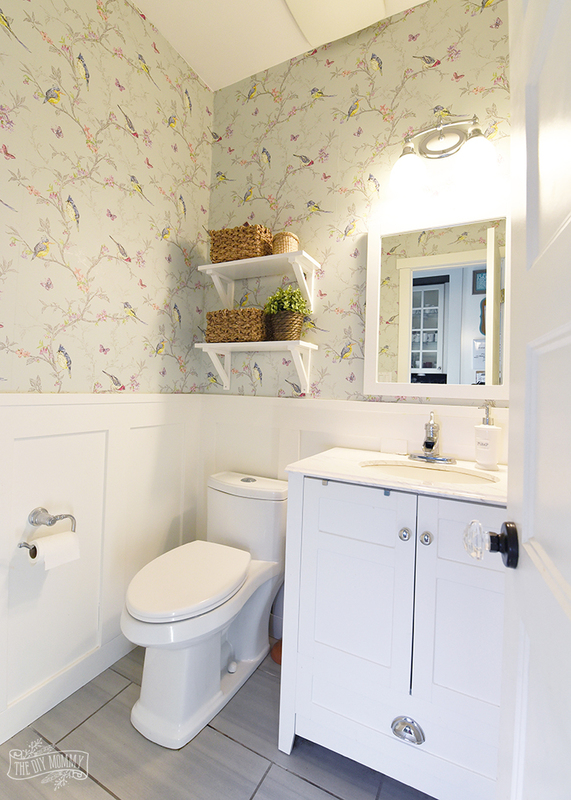 When you’re working with a teeny tiny bathroom like our 25 square foot powder room, you have to be really smart with organization ideas! Let me show you the simple ways I’ve organized our main floor powder room, plus make sure to check out my Organization DIY + Home Decor Challenge playlist on YouTube to see some more fabulous organizing ideas for the new year! 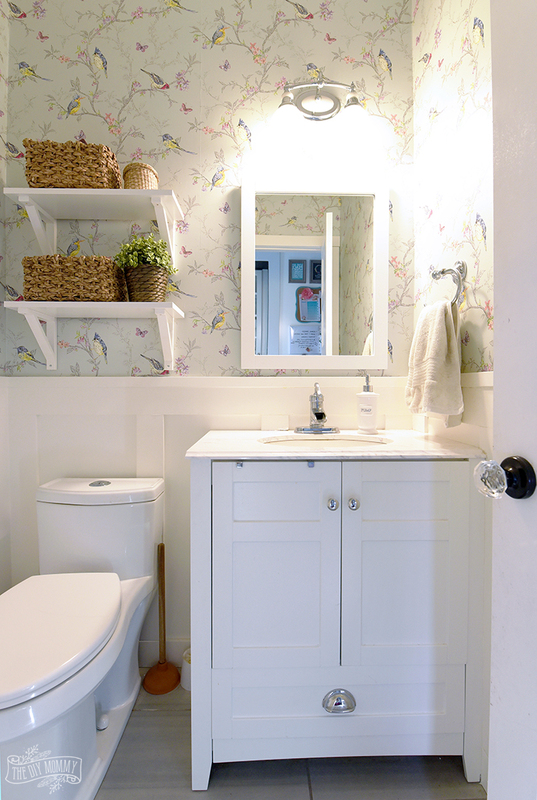 When you need storage space in a small room like a powder room bathroom, there are a few great tricks you can use to get the most bang for your buck. Even though our main floor powder room is technically our guest bathroom, I still do my hair and makeup here so that I can be close to my young kids while I get ready. I have a lot of personal supplies that need to be stored here, so I’ve used some techniques to make everything fit in this 5 foot by 5 foot space. First of all, I’ve used vertical storage. Hanging shelves on the wall above the toilet gives me space on the wall when there’s not much floor space. I’ve also hung a container on the back of the vanity door for vertical storage space for my styling tools. Secondly, I’ve used lots of baskets and containers to store all of our random items. I have pretty sisal baskets on our open shelves, and I have some trays and bins in the vanity to corral more items. Finally, we’ve installed a closed vanity in this space. As much as I love the look of vanities with open bottoms, the closed vanity with doors and a drawer was vital here so that we could store more things. Have a look at my YouTube video to see more, and make sure to check out this video playlist for more organization ideas from my YouTube friends! 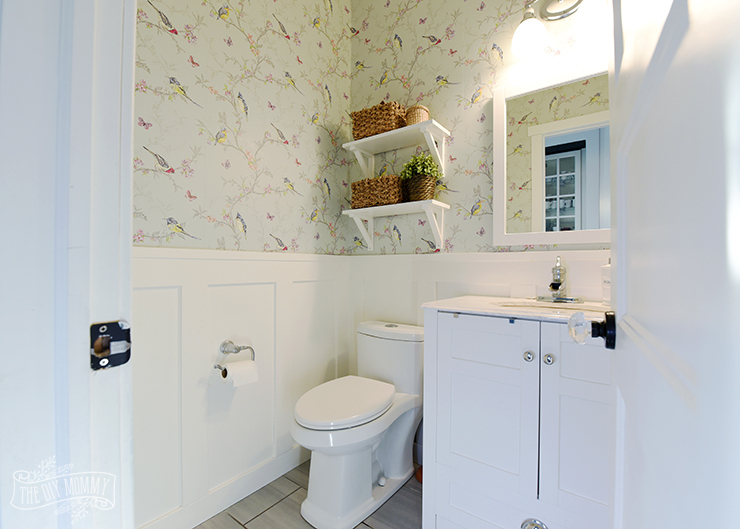 Small bathrooms just like small kitchens are so challenging when it comes to storing whatever you need! Love the video! They are definitely a challenge for storing. Thank you, we’re so happy you enjoyed the video! Good video! Love the wallpaper. I would probably watch the ‘Thrifty Thursdays’, before your other idea. Christina, it’s gorgeous. Love those little shelves with the baskets. And that wallpaper! Beautiful details!